Air Transat Flight TS236, was en route at FL390 when at 05:36 UTC, the crew became aware of a fuel imbalance between the left and right-wing main fuel tanks. Five minutes later the crew concerned about the lower-that-expected fuel quantity indication, decided to divert to Lajes Airport in the Azores. At 05:48 UTC, when the crew ascertained that a fuel leak could be the reason for the possible fuel loss, an emergency was declared to Santa Maria Oceanic Control. At 06:13, at a calculated distance of 135 miles from Lajes, the right engine (Rolls-Royce Trent 772B) flamed out. 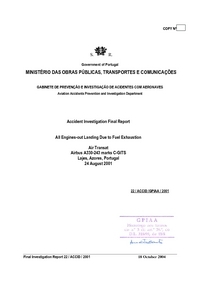 At 06:26, when the aircraft was about 85 nm from Lajes and at an altitude of about FL345, the left engine flamed out. At 06:39 the aircraft was at 13,000 feet and 8 miles from the threshold of runway 33. An engines-out visual approach was carried out and the aircraft landed on runway 33. Eight of the plane's ten tyres burst during the landing. Investigation has determined that a low-pressure fuel line on the right engine, had failed probably as the result of its coming into contact with an adjacent hydraulic line. 1. The replacement engine was received in an unexpected pre-SB configuration to which the operator had not previously been exposed. 2. Neither the engine-receipt nor the engine-change planning process identified the differences in configuration between the engine being removed and the engine being installed, leaving complete reliance for detecting the differences upon the technicians doing the engine change. 3. The lead technician relied on verbal advice during the engine change procedure rather than acquiring access to the relevant SB, which was necessary to properly complete the installation of the post-mod hydraulic pump. 4. The installation of the post-mod hydraulic pump and the post-mod fuel tube with the pre-mod hydraulic tube assembly resulted in a mismatch between the fuel and hydraulic tubes. 5. The mismatched installation of the pre-mod hydraulic tube and the post-mod fuel tube resulted in the tubes coming into contact with each other, which resulted in the fracture of the fuel tube and the fuel leak, the initiating event that led to fuel exhaustion. 6. Although the existence of the optional Rolls-Royce SB RB.211-29-C625 became known during the engine change, the SB was not reviewed during or following the installation of the hydraulic pump, which negated a safety defence that should have prevented the mismatched installation. 7. Although a clearance between the fuel tube and hydraulic tube was achieved during installation by applying some force, the pressurization of the hydraulic line forced the hydraulic tube back to its natural position and eliminated the clearance. 8. The flight crew did not detect that a fuel problem existed until the Fuel ADV advisory was displayed and the fuel imbalance was noted on the Fuel ECAM page. 9. The crew did not correctly evaluate the situation before taking action. 10. The flight crew did not recognize that a fuel leak situation existed and carried out the fuel imbalance procedure from memory, which resulted in the fuel from the left tanks being fed to the leak in the right engine. 11. Conducting the FUEL IMBALANCE procedure by memory negated the defence of the Caution note in the FUEL IMBALANCE checklist that may have caused the crew to consider timely actioning of the FUEL LEAK procedure. 12. Although there were a number of other indications that a significant fuel loss was occurring, the crew did not conclude that a fuel leak situation existed – not actioning the FUEL LEAK procedure was the key factor that led to the fuel exhaustion. (DBY/CS/00697/2001). advising operators, in part, to check all engines to ensure that adequate clearance exists between the fuel and hydraulic line. A Non modification service bulletin is to be issued to formalise this inspection, and will be rendered mandatory by the Bristish Civil Aviation Authority. opportunity within 72 hours elapsed time from the reception of the AOT. Distance from Toronto-Pearson International Airport, ON to Lisboa-Portela de Sacavém Airport as the crow flies is 5700 km (3563 miles).